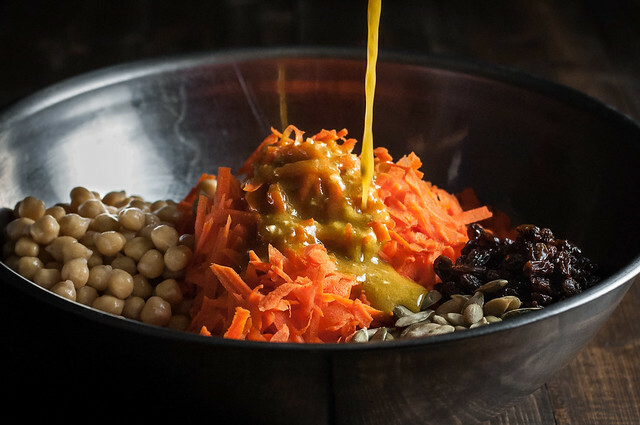 I’ve engineered the dressing to be as bright and tangy as possible, but one of the best parts about my first trial of this carrot salad is the fermented carrots I added. What??? Yes, fermented carrots. They are optional, but indulge me for a minute. I’m a few months into my veggie fermenting adventures, but I’m acting like a pro. After I found the idea and recipe over on Green Kitchen Stories, I pinned it, and soon after, I had an abundance of carrots and CSA cabbage on my hands. It was a matter of letting my produce go bad, freezing it for stock that I might never make, or taking a chance on the eye-popping fermented carrot recipe. I followed GKS’s instructions to a T on that first attempt (I halved the vegetable quantities for two moderate sized jars) and waited patiently as those bright orange jars bubbled on the counter for three weeks. It was love at first bite. I opened the jars to a carbonated pop! and took that first juicy, sour bite. Um, why didn’t anyone tell me sooner that fermented veggies taste sour like vinegar? I adore acidity in my food, so the jars of carrots quickly disappeared into all manner of rice and quinoa bowls and salads…like this one. 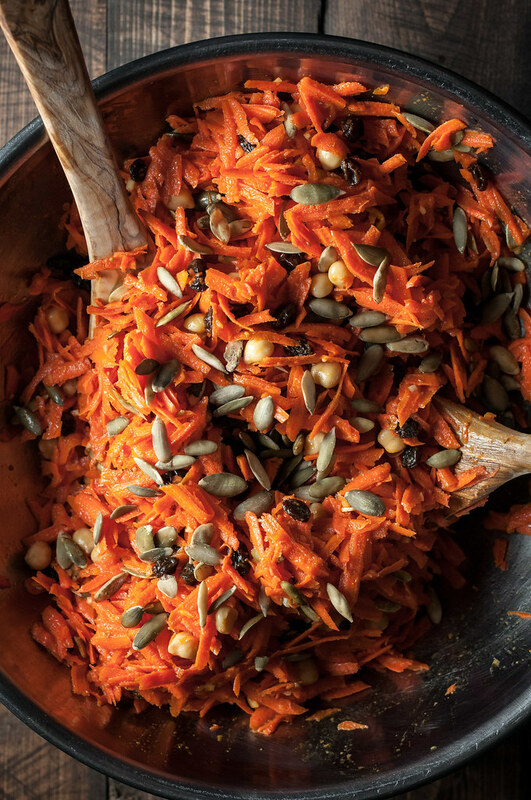 Like I said, the fermented carrots are optional, because it’s impractical for me to include a three week project as an integral ingredient in this spooky salad. However, if you have the time and are up for a slightly messy little project, and if you like anything tart and acidic, I expect you’ll find the “golden kraut” a very welcome, gut-soothing addition. If you don’t have time, and you still love sour food, feel free to boost the ratio of vinegar to oil in the vinaigrette to your liking. What I really like about this salad is that it ends up looking a little rustic and party-worth, but it’s so easy to make. We’re talking 20 minutes, and the only real work is mincing the garlic and grating carrots. To get an idea of how long it takes, I used a box grater to manually grate my carrots, but a food processor like this, with a grater attachment, will save an extra 5 or 10 minutes of prep. I’d highly recommend putting it on your kitchen wish list. If you have a well-stocked pantry, there’s a good chance that the only ingredient you’ll need to add to your shopping list is carrots. 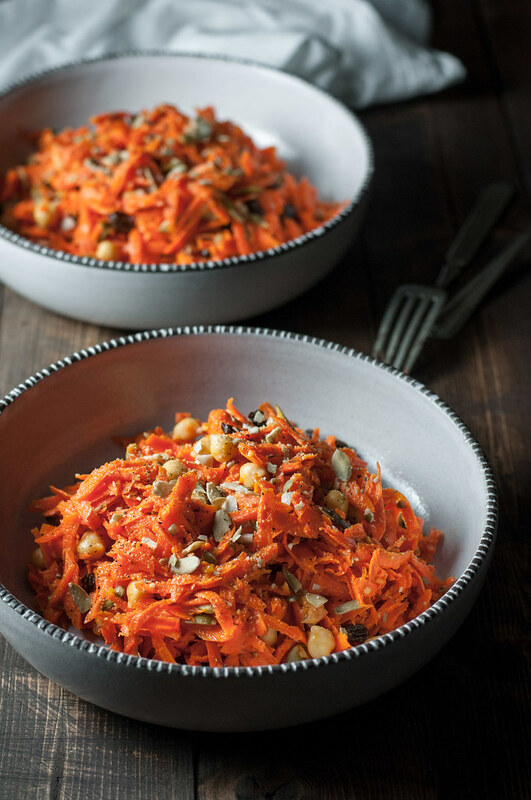 They’re easy to find all year, so despite it’s fall colors, you could serve this carrot salad year round. I don’t know about you, but in the middle of the winter, if I’m going to eat a salad, I’d rather it be based upon colorful, filling carrots than on sad, out of season lettuce. Before we left for Dallas last week, I was doing my best to preserve or eat everything in the fridge, including the 7 cups of carrot salad leftover from recipe testing. It was daunting, until I realized another fact which makes this your new most versatile salad: it’s great for breakfast. I’ve talked about it before, but I’m a big fan of the non-traditional breakfast. Savory is great, but sometimes I don’t even want eggs. I love Molly’s honesty about eating spicy, buttery black beans for breakfast, and we all know how a slice of pizza sometimes looks like the best thing in the fridge at 9:30 AM on a Saturday morning. 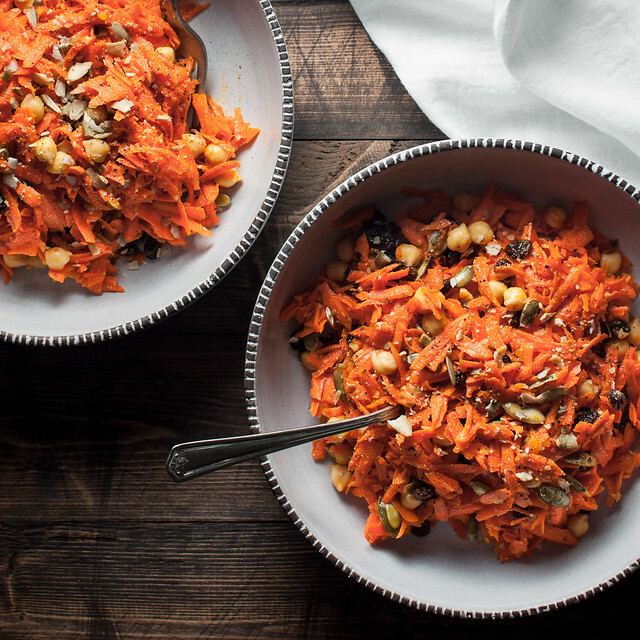 I know that carrot salad is not covered in cheese or built on the perfect tender crust, but it’s ready immediately as leftovers, it brings lots of flavor early in the day, and the pumpkin seeds and chickpeas will fill you up until snack time or lunch. So don’t be ashamed to grab that Gladware and chow down at your desk straight from the container on Monday morning. For a fun, meatless Halloween menu, I’d keep it simple and pair this salad with BBQ black bean burgers. 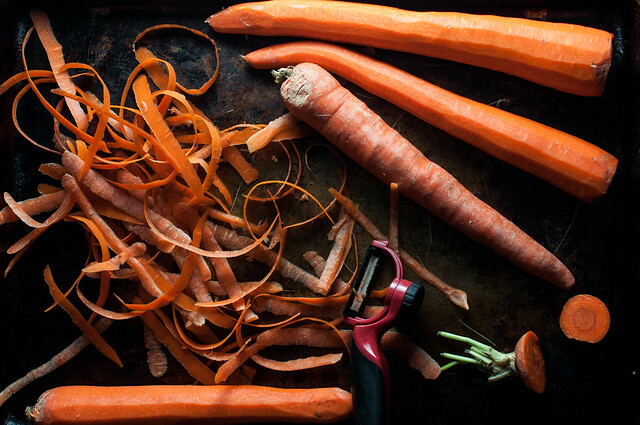 Make the carrot salad (dressed and all) and the burger patties in advance. Then, while your trick-or-treaters are out or are sorting candy like they’ve gone mad, bake up the burgers in the oven, have yourself a glass o’ wine, and prep burger toppings. 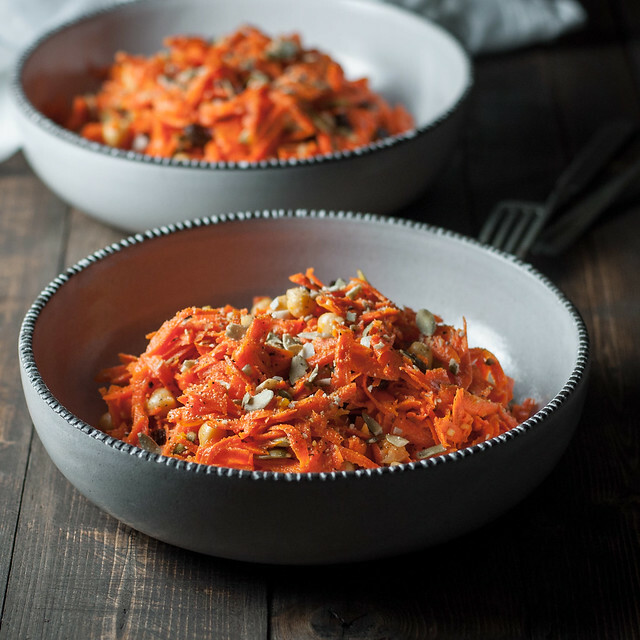 A sweet, sour, and spiced shredded carrot salad. It's perfect for Halloween with the orange, green, and black color scheme, plus the themed pumpkin seeds! To make the vinaigrette, whisk together all ingredients except the oil. When combined, continue whisking while drizzling in the oil until emulsified. Season to taste with more salt, and pepper if desired. 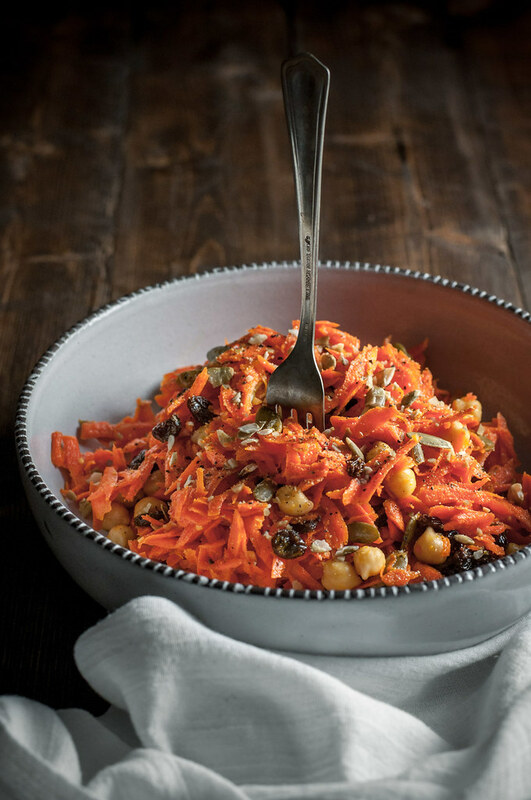 Combine shredded carrots, raisins, all but a couple tablespoons of pumpkin seeds, and chickpeas in a large bowl. Add dressing and toss to combine. Garnish with pumpkin seeds, either leaving them whole or crumbling them, and fresh ground black pepper. Prep time is faster if using the grater attachment of a food processor, instead of a box grater. Fennel and cumin can be purchased whole, as seeds, and ground in a spice grinder or mortar and pestle. If you don't have either, substitute the same quantity pre-ground, or just keep the seeds intact and crush with the side of a chef's knife. Note: This page contains affiliate links. It does NOT contain sponsored content. Affiliate links (to products I recommend, on Amazon) offset my ingredient and website maintenance costs, so I can keep bringing you spooky recipes like this one. Thanks! I made this because I was looking for something to use up the chick peas I had cooked up this past w/e. I skipped the fennel and forgot the pumpkin seeds. I had this for breakfast and it was AMAZING! I can’t wait to spend more time looking around your site.